Holy Thursday/Maundy Thursday and in Dutch Witte Donderdag, literally White Thursday. And we did have snow flurries. The temperature has not yet risen above freezing for the last three weeks. Europe is still in a perma frost. Our 40 plus choir sang for about a 100 parishioners for the Holy Thursday service. It went well. Beautiful music. We used the Missa in Honorem San Ambrosii from Jan Nieland. Easter Sunday morning we will sing from Lloyd Webber’s mass “The Prince of Peace” and a number of other works and conclude with the Hallejah chorus from the Messiah. I met two of my van den Berg Cousins, Karel and Bert, at the Amsterdam Archives. We have the same great-grandmother. I had never yet been in the building. 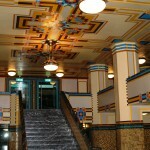 It was built in the early 20th century as the headquarters for the Dutch Trading Company, the successor of the old Dutch East Indies Company. The below pictures were taken in the basement which used to be the bank’s vault. The entire 20th century accounting and business correspondence records of the “Mastmaker” S.J. de Vries are archived in this building. The older records are archived at the Frisian Maritime Museum in Sneek. Working with mirrors. 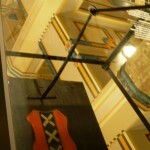 The Amsterdam coat of arms. Monday, March 25th. Still out (in the) cold. Sorry, no pictures of the sweet little Cherubs carrying their Palm Sunday bakery on a stick. I did not dare stick my head out of the door in the biting cold N.E. wind.. The wind died down some today but the mercury stayed close to freezing. I felt better and ran a few errands. It looks like the second bank card is definitely lost as well. The USpostal service is going to send out a tracer and they told my daughter that she can expect an answer within SIXTY days. I have also started a search on this side but without a bar code I will not get very far, I’m told. So. what to do? Try a third tme? No, I don’t think so. It’s bound to end up like my third marriage. I need to pay the rest of my Rome trip and I will soon need start spending some serious bucks on the boat maintenance. I have $ 2.12 left on my Skype account and no way to fund it without a Credit/Debit card, same for Pay Pal, etc. I just got a hold of Lisa before she got into an elevator in Toronto. She will wire me funds into my new dollar account here when she gets back to Tacoma. 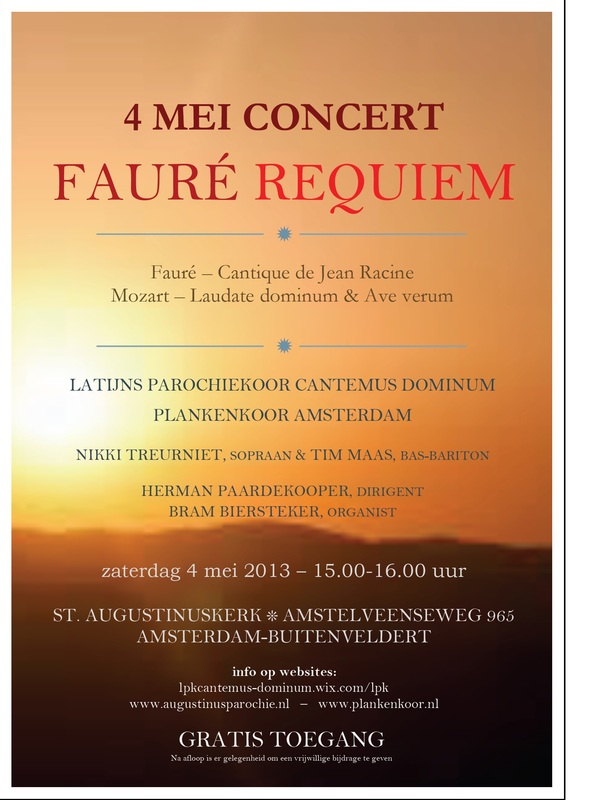 For those of you in the Amsterdam region, put Saturday 4th of May on your agenda. There will be a fitting commemoration for the annual “Dodenherdenking” (for the executed Dutch men and women in the NAZI occupation), where our choir will perform. In the book is an alphabetized list of all the names that are found in the book. There is also a link on the books’ sites for a categorized list of the over 350 names. There are 22 names in the category for the executed Dutch men and women mentioned in the book. Holy Week is called Lijdensweek in Holland. It literally translates to week of suffering/passion. Mine came a week early. I cannot get rid of this cold, it snowed yesterday and I woke up to a frost covered world. And I just had another run in with an automated system of an organization that wishes to claim being set up for international transactions but obviously lacks the means. I once more tracked the progress of my USPostal service delivery of my bank card that was sent to me from Virginia on March 6th. But it shows no further movement than the one into the NY sorting facility on March 10. So, I sent an e-mail, after I have checked off the thousand multiple choices and fill in the address, there is no place for other than a US Destination. So, I try the phone system. I spent an hour trying to give the tracking number by dial pad and voice to the robot and then it finally starts asking if the destination is outside of the United States, then I am cut off and told to call back during working hours….. I will need to go out and forage after being couped up inside since Sunday and take out the trash which is mostly from the three rolls of paper towels I have gone through. But I think I’ll survive. And the digital world has kept me occupied by throwing in some kink into my trying to redesign the book cover for the North American print of “De Mastmakersdochters”. I had to restart the hour long process between Photoshop/Paint because of an unexplained twitch where the text becomes all blurred. And I am yet to solve the hang up on the WP website for the Dutch book. All I want for Easter is to be able to report some more positive experiences. I am one sick puppy. It started on Sunday and it is not getting better yet. This afternoon I was shaking for an hour and had to make sure I kept my tongue tugged in. I have never experienced this. So, please, feel sorry for me.. The last time I was this sick was around the 2005 year’s end, anchored in N.W. Papua New Guinea, before crossing to Palau. I guess it is a bad flue. Drinking lots of fluids, soup but not much else. Well at least I cannot spend any money staying indoors. My new bank card is still floating in Limbo. Jeannine sent it on March 6th. The last tracking record shows March 10 in the New York Sorting station. It must be coming around Cape Horn. The weather here is staying cold, under freezing at night and slightly above during the day. I am getting really discouraged. I need to get started on taking the boat apart now that I have a roof over my head. The other hurdle I have is trying to put the WP web site on line for the http://www.demastmakersdochters.nl/ The English site works fine. Als er ieman is die me daar mee kan helpen of een adres weet. Dan hoor ik dat graag. Het probleem is dat ik geen foto’s kan opladen. Over de jaren heb ik nooit zo’n probleem gehad me deze WP site. 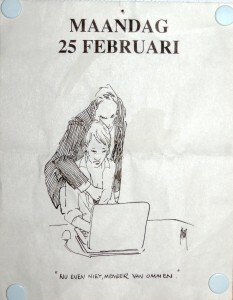 I have just uploaded the Dutch version to Create Space of the print version. This will enable Dutch speaking North Americans to order the book instead of having it sent from Holland. As soon as I have the proper address for it in the next day, I will post it here. 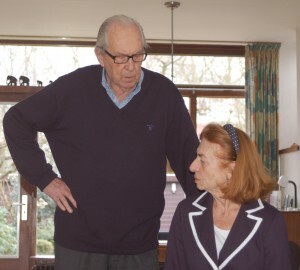 Saturday was the 88th birthday of my sister’s husband, Herman and the 55th of my nephew Dirk Jan. I hope I’ll look as well as Herman in 12 years from now. My sister will turn 79 in May. My twin brother and sister in law also came to the birthday celebration from Germany. Last Sunday we sang part of Bruckner’s mass in C in the Augustinus church. I am missing this evenings weekly choir practice. March 11. I have a roof over my head. Last night was the first night that I had cold feet in my usual warm sleeping bag. It dropped belwo zero again and a bitter cold arctic wind makes it difficult to keep the boat comfortable. Heino, a club member, came to my rescue. I am nice and cozy writing this on his couch. He has moved out of his home and is waiting for the depressed r.e. market to come back. This will give me the opportunity to start disassembling the boat to do the major maintenance. I just tracked my bank card, it left N.Y. yesterday. I should have it later this week. I had enough to get groceries for my new Ménage à Un. The super market is right across the street from where my sister and her family lived for 25 years, off the Pieter Callandtlaan in Osdorp/Slotervaart. It is a 20 minute bicycle ride to the boat. And then last week I made the pages of a popular Dutch cartoon calendar. I’m not proud of it because now you all know my true identity. But it was bound to surface. 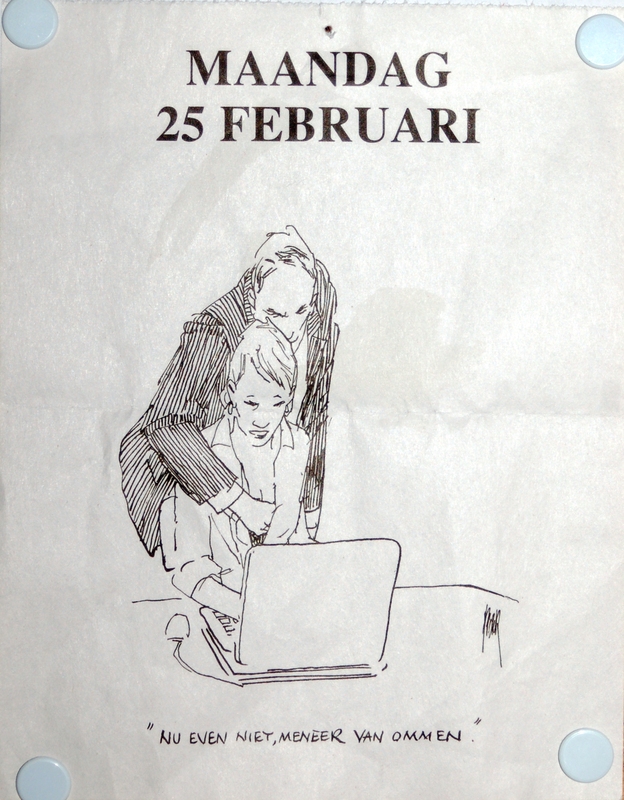 "Not now, Mr. van Ommen"
Thursday February 7th. Licensed to steal. I am totally fed up with my U.S. bank. In order to finance my extravagant life style I have to regularly pull €uroes from the wall with my Bank of America card. My bank card expired on February 28. The replacement was mailed to me a month ago by my daughter, from the Virginia address I use for the bank business. It has yet to be found. I put a stop on the card and yesterday my daughter sent me the replacement. 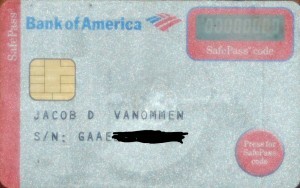 Every time I use the card the BofA charges me $5.00 plus 1% of the amount. So, for a $ 100 withdrawal they collect 6%. With the upcoming repairs on the boat I will need to go to the wall more often and make more payments from my Euro checking account. In order to make deposits into my Euro account I have at times made wire transfers. But this is extremely costly since the bank will only transfer Euroes and the American banks charge a much higher exchange difference than the European banks and on top of it is a $50 flat charge. The alternative is to pull the Euroes from the wall, out of my BofA account, and then deposit the currency into my local account. 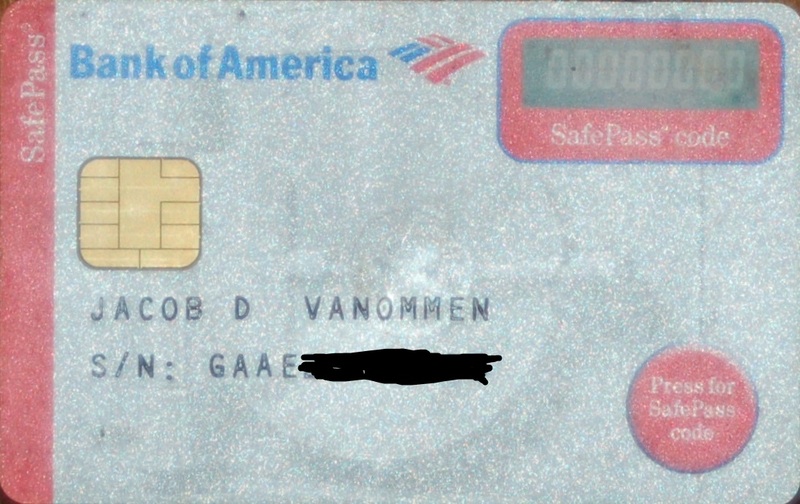 So, inspired by one of my frequent impulses of brilliance, I opened a US$ account with my local banker. Figuring that this way I avoid the BofA fees every time I pull money from the wall. Next I went online to make the Dollar transfer. After I was nearly done with the laundry list of questions, the web site closed. One more try. Then it tells me that I need to use my Safe Pass card, which turned out to have a dead battery. I get on the phone. After repeating my account number, bank card number, social security number, driver license number a hundred times to the automated answering service and to Desmond he tells me. “So sorry, our system is down, can you call back in an hour……”. So then an hour later I have to start all over with James and then I get the same excuse. I am by now getting slightly annoyed and I need to get to my choir practice. I try once more. I get Gail and she puts a stop on my dead battery Safe Pass and tells me to order a new one, and it is going to cost me something like $25 but if I explain the circumstances that I should be able to get a refund, since the battery is over three years old…….. Yes, sure Gail, I’ll just spend another three hours on the internet and telephone to recover $ 25 of your hard earned money. Your access is restricted from viewing this material. Thank you for bearing with me. I may need to print this out and take this with me to the American consulate to get an emergency loan till I get my new Safe Pass…..